The problem I have with this new arrangement is that what to do with my book wall which has four shelves spanning over 12 feet? Some books I’ve read and collected over the years are next to impossible for me to part with. Over the 44 years we’ve been together I’ve collected quite a few as you can see. He says I should begin to get rid of them so he won’t have to worry about what to do with them if I kick the bucket first. I’ve tried over the years to defend my book habit by being mostly stubborn–after all it was better than tippling the proverbial bottle wasn’t it?–but I never had quite the words to defend myself until now. Then I found a quote in Facebook. Of course anyone who truly loves books buys more of them than he or she can read in one fleeting lifetime. A good book resting unopened in its spot on a shelf, full of majestic potentiality, is the most comforting sort of intellectual wallpaper. I’m sure I always knew it, intellectually anyway, but now I know it in my heart that I’m not the only one who feels that way. So I guess we’ll just have to find a way to arrange his giant TV screen, maybe a little more sensible size more in line with the size of the family room, somewhere in between the books. We’ll call the wall “intellectual wallpaper” connecting old and new technology. This entry was posted in Musings, Pop Culture by Alice. Bookmark the permalink. Great quote. Makes me feel better about my addiction. I have my books distributed around the apartment. That’s my way of hiding my habit. I got rid of about half of my collection when I left Chicago. That’s the only thing I’ve had cause to regret. We’re in the process of getting rid of lots of stuff. Hubby just went through a fairly impressive assortment of old/outdated/electronics, and we’re just waiting until tomorrow for the annual de-clutter fair in the city. My books, however, will be one thing I will leave for others to dispense with someday because I simply cannot! I attribute this to a childhood almost totally devoid of books except those available in the tiny country school (and probably outdated) library at school. I love your arrangement!! 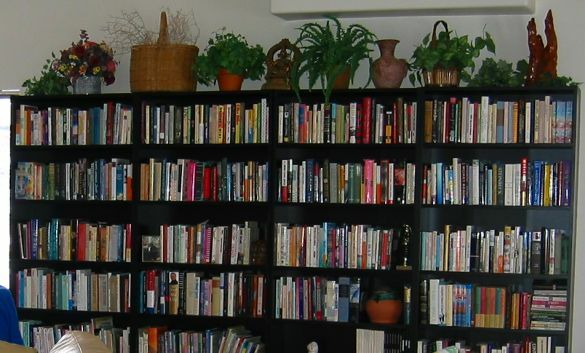 I have six different bookcases and they are around my house in different rooms. I own several hundreds of books also and if I kick, I’m sure my son, a non-reader for pleasure, wouldn’t be torn donating every last one! Anyway, ran totally out of shelf space about 5 years ago, so my ‘rule’ now is (and rules can be bent, of course) is every new-to-me book I acquire after reading must go to a new home. Works pretty and the church fair in the Fall gets any that wouldn’t move along, such as those in the true-crime genre, I don’t know a soul who reads this but me. Why thank you, Anne. The only rule I have about books is that I only buy those that aren’t available to borrow through the library or friends and that I absolutely must at the risk of dying if I don’t read!!!! (Fortunately that’s not too many.) As for that true crime stuff, I’m afraid I got that gene, too, from my Grandma, but my taste is more to the Ann Rule types, psychological and not too gory. I know quite a few people who would agree with that quotation. Oh, you would be so proud of me. I got rid of so many cookbooks…that I miss…this last shuffle. RYN: Glad you like that work, it was one of mine. I loved it, but it was done on paper and very fragile. Thanks for the advice you left. I’m being slothful about making change. No such thing as too many books! Right on! My shelves are those cheapie Billy shelves from Ikea. I think they’re about $69 each, but the books are the real stars anyhow. Don’t need expensive ones, although I would like those lawyer cases, you know the ones with the glass fronts that help keep the dust at bay? Nothing’s ever perfect. I’d love those, too. I’m working on my little den where I keep a lot of my books to it nicer.